Bento boxes originated in Japan, but this clever way of carrying a packed meal has caught on around the world. Whether you’re looking for an easy way to portion-control your meal, an eco-friendly reusable carrying container, or just a really great looking way to carry your lunch, a bento box can be the answer. We’ve combed through all the most popular options and found the very best boxes for you. If you’re tired of using plastic baggies and paper bags to haul your lunch to work or school, read on to find your new lunchtime solution. While the bento box may come from Japan, France based company monbento (French for ‘my bento’) has all but perfected the design. Their MP Original V box is sleek, chic, and extremely functional. The MB bento box is made up of two sturdy and stackable rectangular containers, each with their own lid. An adjustable separator which fits into either of these containers is included, so you can separate foods any way you choose within the box. The topmost lid is dome-shaped, giving you a small space to add chopsticks, napkins, or low-profile cutlery. With this clever design, you can carry everything you need to enjoy your lunch in a single, convenient package. A rugged elastic strap keeps everything together. At 7.3″ x 3.7″ x 3.9”, this box has a fairly large capacity of up to 34 fl oz (1000ml). The two containers are equal in size, with each tier holding 500ml. The box comes in a wide range of different colors to suit all tastes, from classic black or gray to bold fuchsia and sky blue. There are also a huge number of accessories available, so you can carry everything you need for your favorite meals. Sauce cups, molds, bags, cutlery (which comes in a holder that slips perfectly into your existing bento box), and matching water bottles are available in a huge number of color combinations that match the bento box lineup. And yes, you can purchase replacement straps (the most often-lost bento box accessory) for just a few dollars. The monbento box is made from BPA-free, food-grade polypropylene plastic, and has a wonderful soft-touch plastic finish that makes it easy and comfortable to grip. The interior of the box is stain-resistant, but be aware that the soft touch outer finish may hold on to stains if it comes into contact with some strongly-colored foods such as berries or tomatoes. While the boxes are made in China, the company advertises that fair labor practices are used. Unlike many bento boxes on the market, this monbento box is both dishwasher safe and microwaveable – including the lids! In fact, each container lid includes a vent that can be popped open so you can microwave your meal with the lid on, preventing splatters and spills. This tough little box is definitely sturdy enough for children, and it’s easy for them to open and assemble. If you’ll be using this box for very small children, you can even send them off with just one layer, adding the second layer as they (and their appetite) grow bigger. 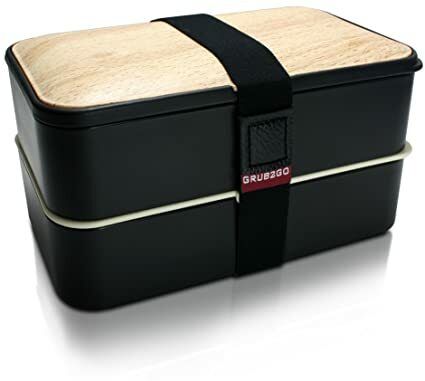 With its stylish, wood-toned top and extra-large size, this premium bento box from GRUB2GO is a well-rounded choice for work or school. Included in this bento box are two main compartments (each with their own air-tight lid), an elastic strap, and a top lid with an attractive wood-grain pattern. A spoon, fork, and knife are also built in. The utensils fit neatly inside a compartment under the top lid. There is no center divider in the main compartments, however, so you may want to invest in silicone dividers or other add-ons if you are thinking of packing multiple dishes within the two tiers of this box. The GRUB2GO box is definitely on the large side, with each compartment holding around 20 fl oz (approx. 600ml), for a total of 40 fl oz (1200ml). This extra capacity is perfect for those who have already found that normal bentos are a bit on the small side. The outer dimensions of the assembled box are 7.5” x 4.0” x 4.3”, just a bit larger than the monbento. Made from BPA-free, food-safe plastic, this box is sturdily built and will stand up to a lot of hauling around. The lid is not actually made from wood, but has a wood pattern printed on the plastic surface. The exterior of the GRUB2GO’s main compartments have a rubberized surface, giving you a solid grip on the box when carrying by hand. This bento box is sturdy enough to stand up to the dishwasher, freezer, and even the microwave (for reheating only – not for cooking food). The silicone-lined lids include a vent, so you can microwave your lunch with the lid still on. To be safe, however, some users recommend washing the lids by hand to make sure they still seal tightly, since high temperature washing may warp them slightly. As long as you take care when washing the lids, this box will definitely stand up to a beating – in fact, this box is so sturdy that it’s backed by an industry-leading 2-year warranty. The range of color choices isn’t as wide for this GRUB2GO box as there are with our gold pick. In fact, you can really only choose between a black box with a wood-grain top, and a black box with a black top. Nevertheless, the box is attractive enough that you might not mind. The standout feature of the GRUB2GO bento box is its tight-sealing lids. Many bento boxes are made for solid foods only, and have loose lids that are only held in place by the outer strap. The GRUB2GO, however has an airtight lid that clamps on tightly enough to keep even wet foods inside, so you won’t have to worry about your lunch leaking inside your bag. 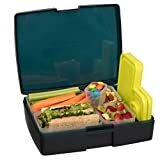 This bento box may be a better choice for adults and older children, since the tight seal on the lid may make it a bit tricky for very young users to open. If you find that it’s tough to get the lid off when first using your box, try setting it flat on the table and pressing down in the middle while lifting one corner of the lid to break the seal. Want some flexibility in your lunch box? The multi-compartment style of the Bentology bento box lets you mix, match, and portion your meal any way you’d like. The name Bentology may be new, but the California-based company has been around for some time now. Formerly known as Laptop Lunches, the brand was recently re-launched with a new name and improved look. While these boxes were originally designed for children, teachers and parents quickly began using the clever boxes themselves – and the brand grew from there. As part of their efforts to keep lunchtime fun, Bentology also offers an app in the iTunes store called Lunch Ideas that provides recipes and ideas for both adult and child meals. The Bentology bento box has a unique design quite unlike the more traditional, stacked-box style of our Gold and Silver picks. Instead of uniform containers that nest together, Bentology bentos feature one large outer container and a selection of smaller boxes nested inside, including an extra-small one that’s perfect for sauces or dips. The main box has a built-in handle, which can be used to clip the box on to your bag for hands-free carrying. Made from BPA-free, food-safe polypropylene plastic, Bentology’s box is also dishwasher-safe. If you wash your boxes by hand, however, be aware that all those little containers mean a lot of pieces to clean. The outer box measures about 9” x 7” x 2.3”, and the whole system holds about 34 fl oz (1000ml). And, unlike most other bento boxes, Bentology products are made in the USA. Even when all of the inner containers are inside the main box, there is a little room to spare, providing a space on the side to tuck in silverware or napkins. Some of the inner containers include lids and some do not. Since you can toss in or remove dishes as needed, this provides a great deal of flexibility when planning out your meals. For storage, the inner containers nest together neatly and take up a minimal amount of space in your cabinet when not in use. Bentology boxes are thoughtfully designed. For example, the lidded inner containers lids have rounded corners, while lid-less containers have square edges. It’s a small design detail, but makes a huge difference when you’re trying to identify which containers can be sealed and which will be left open when rushing to get lunch packed in the morning. If you’ll be carrying foods that are prone to spilling, the Bentology box is an especially great choice – the tight-sealing lids are even guaranteed to keep soup from leaking. Best of all, users report that the lids still provide a tight seal even after years of being run through the dishwasher. With so many ways to assemble the containers in the Bentology box, you may find that a little tweaking is needed to get all of the bins to line up before you can close the lid. Unlike stack-able traditional bento box designs, the horizontal layout of this box means that it won’t fit in most standard insulated lunch bags, so be aware that your existing lunch bags will probably be too small. If you’re considering the Bentology box for a child’s lunchbox, the secure lid may be a bit of a challenge, since the tight seal can be a bit tricky for very young users to open on their own. If your child is prone to misplacing some lunch items, note that all of the little dividers and lids may be easy for children to lose track of. 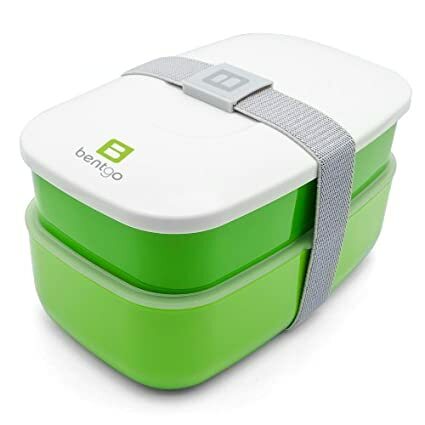 If you’re looking for a simple but stylish way to carry your lunch wherever you need to go, the Bentgo bento box has you covered at a very reasonable price. Bentgo’s all-in-one bento box has a traditional, stackable design. The two containers are of unequal size, so you can use the different-sized areas of the box for easy portion control. The smaller container includes a fixed divider in the middle, while the larger container provides a wide-open space for salads, sandwiches, or other entrees. The lid that separates the two layers also serves as a silverware container, and holds the knife, fork, and spoon included with the box. While the silverware doesn’t snap in place securely and is somewhat prone to popping out when the box is opened, it’s still very convenient to have full-sized utensils on hand at all times. The box is topped off with a white lid and held together with a stretch-able gray strap. While the strap holds the box components together, it doesn’t provide a leak-proof seal, and the strap can slip off if handled roughly. Make sure you keep the container mostly upright when transporting. Bentgo boxes come in several colors: rich blue, bright green, warm purple, and classic gray. In each color, the smaller container is a slightly darker tone, while the larger container is lighter, making it easy to spot the pieces you need while rushing to prepare lunch. The smaller Bentgo container measures 6.8” x 4.3” x 1.7” and holds around 12.5 fl oz (370ml), while the bigger bottom container is 7” x 4.5” x 2.5” and can hold about 26 fl oz (770ml). This gives the Bentgo a respectable total carrying capacity of about 38.5 fl oz (1140ml) for the entire box. The Bentgo has been cleverly designed to store in a small space. All of the pieces nest into the bottom container, so it won’t take up too much room when lunch is over, and is easy to store at home. These boxes are made from BPA-free, food-grade plastic. Cleanup is easy, as the main parts of the box are dishwasher-safe. The box can also be put into the microwave for reheating – but not for cooking, as Bentgo recommends that you keep the heat under 220 degrees F (104C) for the main containers. The center divider is not microwavable or dishwasher-safe, however, so be sure to remove it before heating or washing. 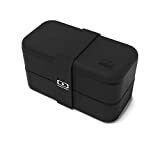 A number of accessories are available from Bentgo, including an insulated bag, ice packs, and a leak-proof cup for carrying liquids that might be prone to spilling in the main box. The accessories are color-coordinated with all of the available bento colors. Best of all, you can get replacement parts if needed, a perfect feature if you or your child misplace the silverware or the box strap. This box even comes with a remarkable 2-year warranty, like our Silver pick. And if you’re looking for some new menu ideas, each Bentgo includes a free eBook with 30 recipes and lunch ideas. Bigger isn’t always better when it comes to bento boxes! While all of our top picks will carry a good-sized meal for even an adult appetite, there may be times when you need to carry more or less food. As a rule of thumb, the number of milliliters in a bento box is about equal to the number of calories in the lunch. If you’re interested in portion control, this is a wonderfully easy way to make sure you’re getting just the right amount. Our gold pick from monbento has a respectable total capacity of 1000ml, and can easily be assembled with only one 500ml container if desired. The movable divider in the Gold pick allows you to divide up your space however you want between the two tiers. The extra-large GRUB2GO box, our silver pick, can be put together to take advantage of its large 1200ml total capacity, or split in half so you can use just one 600ml container. While it doesn’t include a divider to separate your food within the two tiers, this box’s large size gives you plenty of space to add silicone dividers or accessories if you’d like to split dishes within each container. Bentology’s innovative design lets you portion your food any way you want within its 1000ml total capacity, allowing you to mix and match containers as needed. However, since the outer container always remains the same size, it’s not as easy to split this box down into a smaller size. 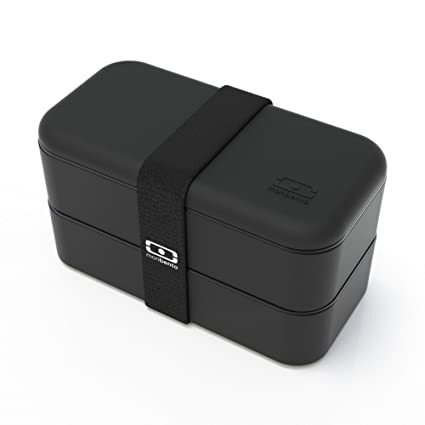 Finally, the Bentgo box comes right in the middle of the size range, with a total capacity of about 1140ml. Its two unequally sized containers (holding 370ml and 770ml, respectively) can be split apart, but be aware that you might need to secure the separate sections with more than just the bento strap. While our budget pick only has a fixed divider, you can still get a lot of flexibility out of the unequally-sized containers. If you want to carry liquid items without spilling, consider our bronze pick. Bentology touts its containers as completely leak-proof, and you can even carry soup in one of the lidded inner containers without worrying about a spill. And with the outer container completely enclosing everything, you have two layers of defense against spillage. Bentology’s boxes do take up a fair amount of space in your bag, however. If you’d like a box that has a lower profile but will still keep things from leaking, our silver pick from GRUB2GO is a fantastic choice. It has a powerful seal that will keep your lunch where it belongs – not all over your gear. Unless you expect to carry soups and heavily sauced dishes, our top pick from monbento will hold all of your standard lunch fare like sandwiches, rice dishes, and other typical bento box dishes securely. While all of our picks for the best bento boxes can withstand some time in the microwave, if you’ll be heating up your lunch regularly, take a look at our top two choices. Both the monbento MB Original and GRUB2GO premium bentos can take the heat and even have vented lids, so you can heat your lunch without any splashes or splatters. Similarly, all of these top boxes are dishwasher-safe. There are just a few things to note, however. The Bentology box does come with some small pieces that may get caught in the dishwasher, so be careful when positioning them inside the machine. A few users have reported that GRUB2GO’s fantastic lids don’t seal quite as tightly after a few extra-hot cycles through the dishwasher, so be careful to wash them on the top rack, or by hand. Finally, note that the center divider of the budget pick from Bentgo is neither microwave nor dishwasher safe, even though the rest of the box is. 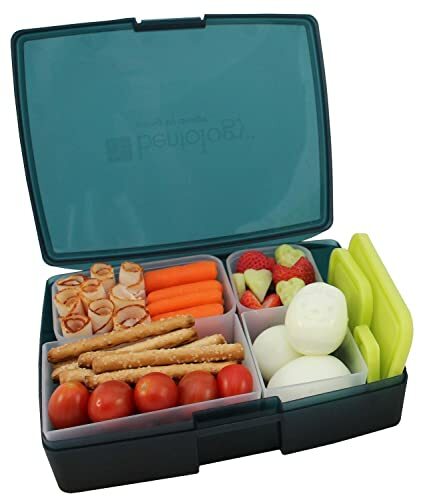 Bento boxes are a great choice for kids’ lunches. They provide a fun alternative to plain paper bags, and are an eco-friendly choice. Our gold pick from monbento is perfect for children, since it’s sturdy and simple to use, without a lot of loose pieces that could be lost. Both GRUB2GO and Bentology’s bento boxes could work very well for most school-age children, but the tight lids mean there’s a trade-off. While lunch won’t spill in their bags, the lids may be too tough for very young children to open. Bentology’s setup also includes a lot of individual containers and lids that could be misplaced. 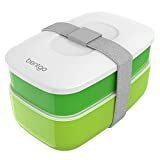 Bentgo, our budget pick, is great for children who can carry the box neatly – but since the lids stack together relatively loosely, the box may come apart if it’s bounced around roughly in a backpack. Using a bento box is a great way to save money, eat healthier, and reduce the amount of garbage you have to throw away. Carrying your own packed lunch means that you’ll be spending far less on eating out, and you’ll also be done spending money on plastic and paper lunch bags you’re only going to throw away in the end. If you want, you can even use your bento box to create some edible lunchtime art.